The family had previously built a smaller home in Prebbleton village, but with their two children now teenagers and Kyle, with his rural background, wanting to have more space around him, they purchased a 5000 square metre section as the site of their next project. Kyle, who has studied architectural draughting, designed their last three homes and took to the drawing board again to create the plans for this new and expansive home, carefully thought out to cater for everyone in the family. With the intention of creating two separate wings, one for teenagers and one for parents, in a mirror image of each other and with large, open living spaces between, the design encompasses four bedrooms, three bathrooms, laundry, two living areas, dining room and kitchen with a large scullery. The teenage wing also has a shared lounge area with a TV and couches for the kids and their friends. 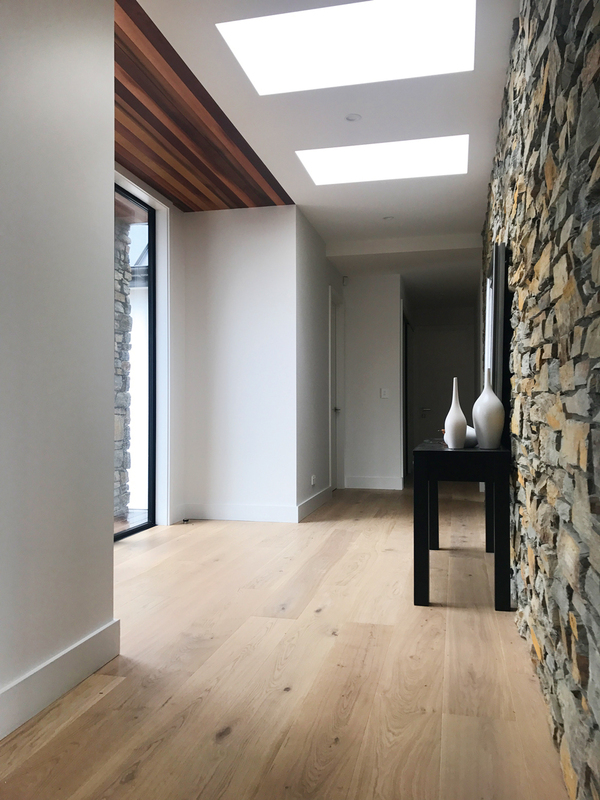 And, at the other end of the house, the couple's master bedroom is spacious with a high ceiling to make the room feel more like a living space for them to spend time in. This wing also encompasses an office nook and a walk-in wardrobe leading to the ensuite. When it came to making choices about interior colours and soft furnishings, Rebekah took over from Kyle to put her stamp on their new home. In the kitchen, the cabinetry was brought in from Germany as the couple wanted the look of natural wood with the durability of a laminate material. The benchtop is an engineered stone with the island designed for entertaining, and the sink and hob facing out into the living space. This presented the challenge of how to deal with the extraction ducting, which was solved by constructing the bulkhead above. Kyle had included a lot of glass in his design as he wanted to be able to see right through the home, through the central gas fireplace and out the other side. After spotting glass doors in a commercial building he also went for glass internal doors creating a feeling of seamless spaciousness. 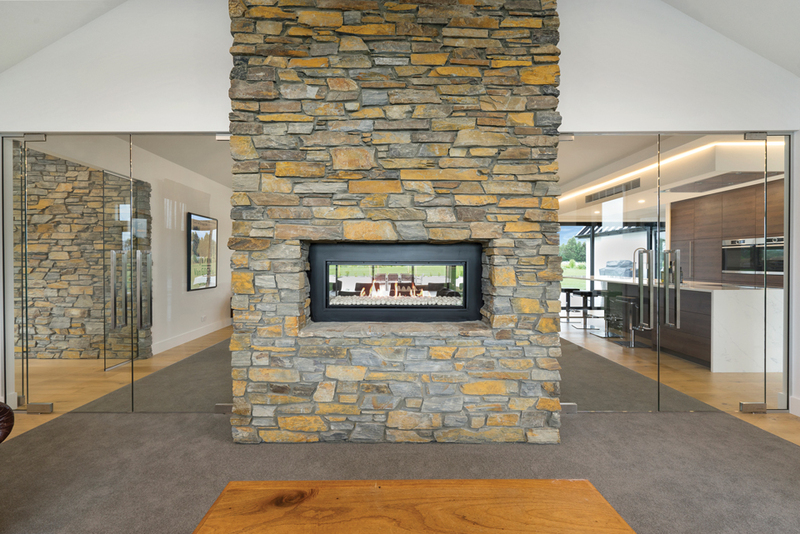 Flanked by these glass doors is the most striking feature of the home, the Wanaka schist fireplace which presides over both of the living areas. 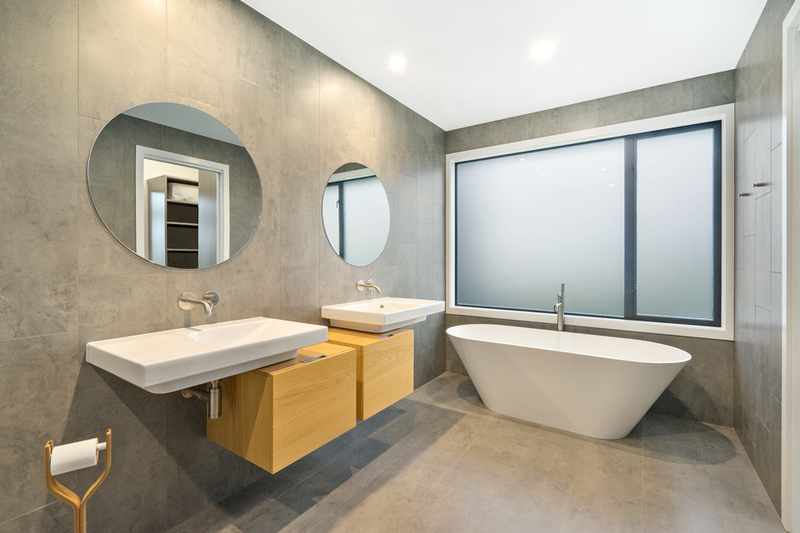 It’s such a large structure that the choice was made to opt for a stone veneer product made from natural stone that gives the same look as solid stones but reduces the weight. As the build progressed, an additional window was added high up in the living area to mirror one opposite, another ‘on the fly’ improvement that the homeowners are glad Leo picked up on before it was too late. All of the windows in the home are Rylock’s 40 Pacific Architectural Pro Suite in Mannex Matt Black powder coat organised by Brent from Rylock Canterbury, who supplied both Euro sliders and Euro stackers for the build with colour matched hardware in Matt Black from their Malta range. Having lived in the house now for 18 months and having had a chance to savour their beautiful spacious home, the sunken outdoor lounge area and the privacy of the dual wing arrangement, the couple couldn’t be happier with the results. And, of course, there is the coveted gold medal award from House of the Year, delivered as promised. Perhaps the real proof of the pudding though, is that even after working through a big project like this one, Rebekah is still keen to build another home in the future.